Having trimmed NVIDIA drivers for as long as I can remember, long ago I decided to make a utility to help make the modification and installation process more bearable. Only lately I decided to make it more presentable, hopefully making it usable by the general public. The app is pretty bare bones, and probably has bugs the size of rhinos, but I promise I'll work on it if it catches on and there's demand for improvements. Speaking of improvements, I have a dependency definition scheme in the works, which would enable to define modules that depend on others (eg. the 3D Vision controller making no sense without 3D Vision). Also, I intend to add the option to repackage the drivers into a SFX archive. Any bug reports and/or suggestions are welcome. bernek, Apparatus, somemadcaaant and 61 others like this. This is so amazing! I will test it out right away when at home. This can be a fantastic alternative to manual driver cleaning. Really appreciate your efforts. bernek and uKER like this. Very nice, after some testing from the community, would you perhaps like to have this posted in our download section? bernek, akbaar, Phragmeister and 9 others like this. @Hilbert Hagedoorn it would be an honor. bernek, akbaar, Phragmeister and 6 others like this. Question: can all items in Miscellaneous be removed if going for absolute barebones, have you tested yourself? Works like a charm. It creates a folder in the temp, deletes ticked files and cleans the .cfg. Bravo! The only suggestion I have is to move PPC folder into core for win 10 installation, and same for Win 7/8/8.1 for Miracast. Excellent, let's await a bit more testing and bug fixing and we'll get that sorted. The1, TheDeeGee, uKER and 1 other person like this. Wow, great tool man, thx! works as charm. Although in newest driver it seems is new catalogue. So there was notice. Worked anyway. Reboot and ill check results in games. Yeah, you can perform a functional installation just by selecting the two items marked as mandatory. PhysX is preselected just as a "recommended" item. I install only those three and HD Audio, since I have an HDMI AVR. The categorization is just a visual thing. It doesn't have any functional significance. I mostly added it as a way to have the most well-known items, the ones most people would want to install, at the top. Is this PPC something people regularly use? I had never heard of it until yesterday, when I started doing the cleanup to the app, and took a look at what modules I had been ignoring all this time. Also, I'm not doing any differentiation regarding OS version. Am I missing something? I'm testing with 411.63 Win 10 x64 and handled all folders in that one, but yeah, I saw to include proper handling of unknown folders. Feel free to report those and I'll add them right away. The best way would probably be to give me the URL of the driver package that has the unrecognized folder. evgenim and AsiJu like this. Well...it was just from here dl'ed. I mean g3d. But windows 7/8 64bit version. Excellent! I'll test run with new 411 driver once I have some time to spend on PC. @AsiJu asked pretty much that. It's more or less what you said, only swapping "Install Core" in instead of "Display Update". Bhudda and AsiJu like this. Good to hear it's working so far. I just implemented the repackaging of the modified driver into a new installer package. I also added a previously unhandled Windows 7 installer folder, and touched up a couple of the modules' descriptions. I'll let this roll for a bit more and hopefully put out a new version in a couple of days. What i need to "check" for proper working my TV via hdmi and shadowplay features? will be downloading and testing as soon as i install a new driver.. Your TV will always work. No matter what. For ShadowPlay you'll probably need ShadowPlay and GF Experience. It will become more user friendly once I implement the dependency checks. Coming soon. 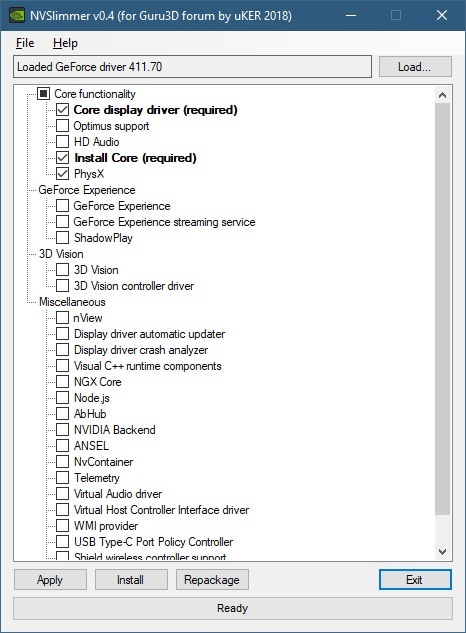 Also, does anyone happen to know how to find out what platform a driver package is for? ie, operating system version (7, 8, 10) and platform (x86, 64). @Hilbert Hagedoorn Can we make this thread one of the stickies in this sub-forum please? Thank you.